Embroiderers' Association of Canada, Inc.: What is an EAC Cyber Course? Cyber Courses are similar to Project Courses. The advantages are working and sharing with a group that can be close to you, or across the country and beyond. Many of these courses have been taught at Seminars in the past and give other EAC members a chance to participate in doing a Seminar-quality course. When you register for a Cyber Course, you will have to give your email address or that of a friend who is willing to pass frequent messages to you. 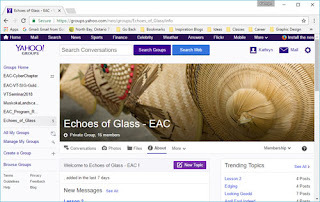 A few weeks before the class starts, you will be invited to join a Yahoo group by the Online Assistant. 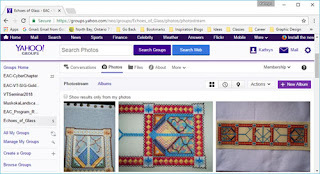 This group will become your shared stitching haven where you will find and download lessons and pictures from the author; ask questions; share with and encourage your fellow students; and post pictures of your progress. Your email address and identity will be visible to all participants, including the author and the Online Assistant who coordinates the course. Admittedly, Yahoo is not a perfectly secure system. No one on the Education Committee has ever heard of a totally secure system. Even Canada Post is not perfectly secure; mail can be lost or stolen. 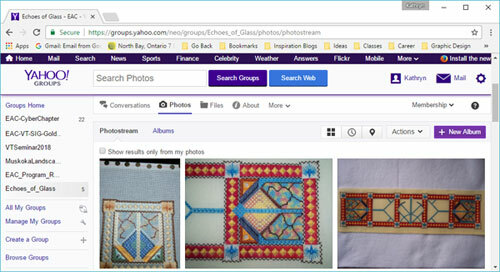 However, Yahoo is free and serviceable, and it has all the features we need. We have never had any problems with it in the over ten years we have used it for Cyber Courses. Yes, you can access Yahoo Groups on an iPad, through your browser (Safari, Firefox, Chrome). Education understands that some participants prefer to purchase a kit, so that option will be offered for specific courses if the author is willing to prepare and send out kits. 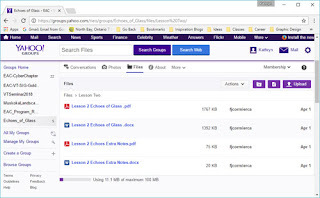 After the course is over, the site will be left in place for a few weeks so that students can download anything they want or need before everything is deleted. Cyber Courses are meant to be a fun way to work with the author and the other students from the comfort of your home, asking questions along the way and sharing photos of your progress. ONLY the registered participants, author and Online Assistant will have access to the sharing involved in a cyber course. We feel this is a clear advantage and one aspect of online learning many are adopting.